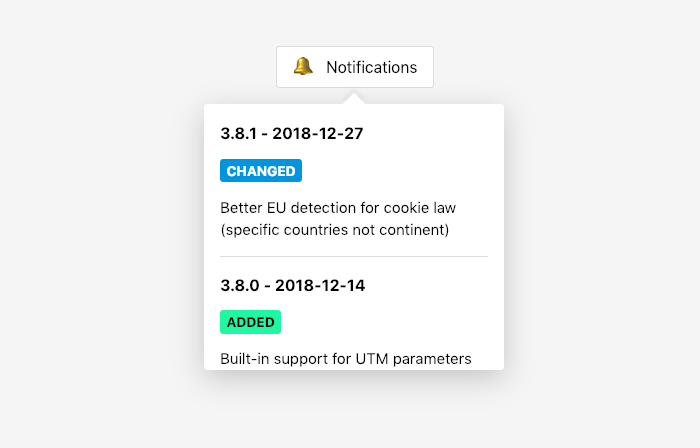 Changebar is a GitHub-powered changelog notifications widget for the web. Easily tell your users what's new, fetched directly from GitHub by Staticaly CDN. Changebar adds the changebar-is-fetching, changebar-has-error, and changebar-completed classes to your button to keep track of the Fetch requests. It also adds the data-unread-count attribute with the number of unread notifications and the changebar-has-unread class if there are unread notifications.